A feature-length documentary delving into what it took to make Tim Burton's Beetlejuice is currently in the works. Produced by Adam F. Goldberg (The Goldbergs) and Lee Leshen (Back In Time), the movie is directed by French Beetlejuice superfan Fred China. Documentary for The Recently Deceased: The Making of Beetlejuice has been in progress since last year when China launched his first crowdfunding campaign for the movie. Now, the filmmaker is seeking additional funds to secure the documentary's completion by way of a new Kickstarter campaign. 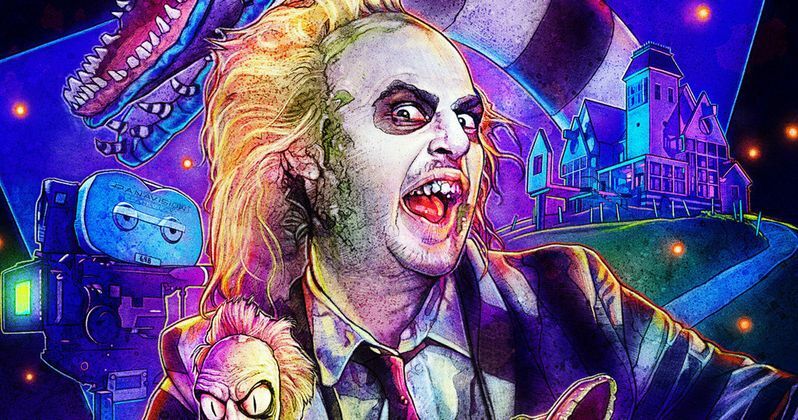 To help entice more potential donors, China has an incredible new Beetlejuice poster that comes from Stranger Things artist Kyle Lambert, which is a must for any fan of the Ghost with the most. There is also a sneak peek at the upcoming movie, letting people know what they can expect from the finished product, which was previously released earlier in the year. With just under two weeks left to go, the current campaign has raised over $17,000 for the movie's budget. China is hoping to top $56,856 to meet the project's targeted goal. Previously, China has been in touch with 13 crew members who've worked on the movie, primarily from the special effects department. The director is hoping to secure more interviews with the new funds raised for the movie, promising new names to be added from the Beetlejuice cast and crew. Names confirmed to appear in the movie so far include Oscar-winning makeup artist Robert Short and art director Tom Duffield. Beetlejuice is one of those widely-beloved movies from the past which somehow never saw a remake or a sequel. Some fans would undoubtedly prefer for it to stay this way, as the classic Burton movie is unlikely to ever be topped. Still, rumors of a Beetlejuice 2 have persisted for years, and it's certainly possible the sequel will come to fruition one day. Star Michael Keaton has publicly commented that he's fully on board with reprising the role, and Burton has also said he's open to the project if the right idea comes along. Given the rising popularity of new sequels to classic movies, however, the chances seem to be greater of the possible sequel finally happening. Fans of new documentaries covering classic horror movies have plenty to look forward to in addition to Documentary for the Recently Deceased. Extensive docs made for Night of the Demons and the original IT are currently in the works as well. Given that Beetlejuice never had a follow-up movie or a reboot, this new doc should be particularly exciting as it will at least let the movie's biggest fans learn something new about the classic film. A companion documentary isn't quite a new Beetlejuice, but it's the next best thing. One interesting revelation told by casting director Jane Jenkins is that each one of the movie's main actors initially turned down their roles. This includes Michael Keaton, Winona Ryder, Geena Davis, and Alec Baldwin. Needless to say, it wasn't exactly easy to get the movie made, and it will be entertaining to learn about everything it took to bring the now-iconic character of Beetlejuice to the big screen. You can donate to the project by heading on over to Kickstarter, and you can get your own amazing poster if you pledge the right amount. This art is included on T-shirts, mugs and a pretty cool pop-up card. Other items will be unlocked as more money is donated to the cause.